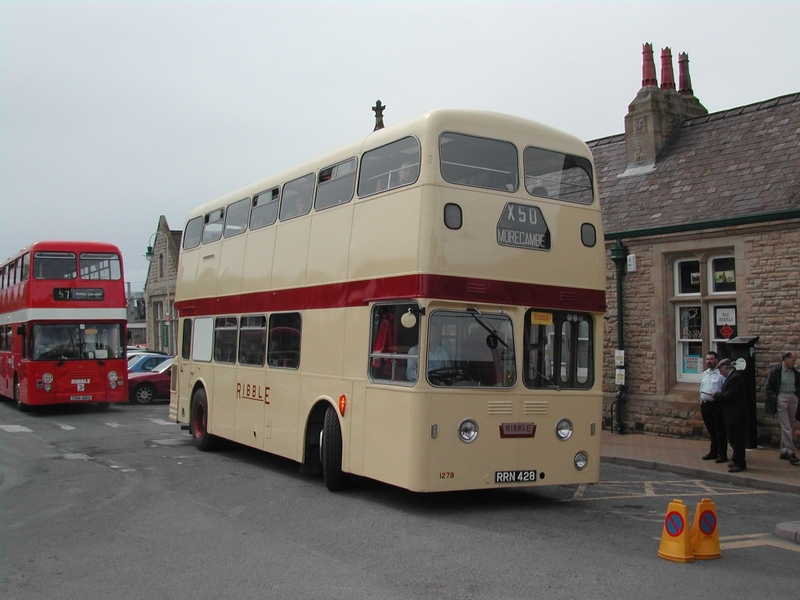 Ribble put 20 of these double deck coaches into service in 1962 to replace an earlier batch of PD2 White Ladies. The name derived from a ghostly woman who was reputed to haunt Samlesbury Hall. They were used on express services in Lancashire and nearby areas; for example the X43 from Skipton to Manchester and X60 Manchester-Blackpool. They clocked up considerable mileages and some are known to have done over one million miles while with Ribble. Originally delivered in cream and red coach livery they were later painted in poppy red bus livery before being withdrawn in 1976/7. 1279 was acquired by a small company, Gagg of Bunny near Nottingham, who operated it well into the 1990s. Originally bought for preservation by a preservationist in Nottingham it joined the RVPT collection in 2000. Following extensive mechanical and body work it was repainted in original style and attended many rallies and running days. It was then taken out of service for structural repairs and internal refurbishment which is currently (2017) ongoing. We hope to have it back in service within two years.